Embattled Australian Prime Minister Malcolm Turnbull is unlikely to contest a second leadership ballot, making way for Treasurer Scott Morrison as a surprise challenger for the top job, Sky News reported on Thursday. Turnbull has been told he has lost the support of the Liberal party room and should step down as Prime Minister. The crisis has deepened ever further with the Government trying to adjourn Parliament. Labor leader Bill Shorten said Australia no longer has a functioning Government. “It is not the Parliament that has failed, it is the Turnbull Liberal Government that has failed,” Shorten told the chamber. The shock move came after senior Liberals said they believed Peter Dutton had enough support to become leader with Victorian Greg Hunt as his deputy. But Treasurer Scott Morrison is also planning to stand for the Liberal leadership now that it is clear Turnbull no longer has enough support to remain PM. Senate leader Mathias Cormann and fellow Cabinet ministers Mitch Fifield and Michaelia Cash have told Turnbull he should go, and all have resigned. Turnbull's Ministry dissolved this morning, with frontbenchers including Hunt, Trade Minister Steve Ciobo, Human Services Minister Michael Keenan, Cyber Security Minister Angus Taylor and Alan Tudge all insisting their resignations be accepted. 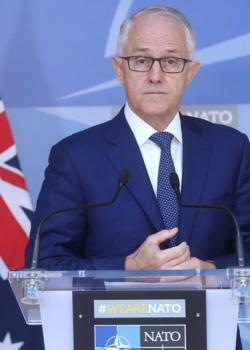 Turnbull's strongest backers, including Foreign Minister Julie Bishop, Education Minister Simon Birmingham, Defence Minister Marise Payne and Defence Industry Minister Christopher Pyne are staying firmly with him. They are expected to throw their support behind Morrison in a challenge. Senator Cormann, a key Liberal powerbroker, said he believed Dutton was the best person to lead the country to the next election. “It is with great sadness and a heavy heart that we went to see the PM yesterday afternoon to advise him that in our judgement, he no longer enjoyed the majority of support of Liberal members,” he said. Senators Cormann, Fifield and Cash said a majority of their party room colleagues believed there should be a leadership change. Turnbull called a snap leadership ballot on Tuesday and won by 48 votes to 35. Dutton's supporters were enthused by that result and have pushed hard ever since for another vote. Senator Cormann said more Liberal MPs had told him since Tuesday that they had switched their support to Dutton from Turnbull. “We cannot allow this situation to continue,” Senator Fifield said. Turnbull has not yet said how he will respond to the apparent collapse in his support. With Dutton appearing set to become Prime Minister, Labor unsuccessfully tried to refer him to the High Court over his eligibility to sit in Parliament. The vote to send Dutton to the High Court failed by the narrowest possible margin, 68 for and 69 against. Turnbull voted with the rest of the Coalition against sending Dutton to the High Court. Dutton's register of members interests shows he is the beneficiary of a family trust with interests in childcare centres in Queensland. Those centres, like many around the nation receive Commonwealth Government subsidies. Meanwhile, The Turnbull government has successfully moved to adjourn Parliament amid a battle over the Liberal leadership, with Bill Shorten arguing the coalition is “irreparably split” and should hang their heads in shame. Manager of Opposition Business Tony Burke quickly ripped into the “extraordinary” development. “What is happening right now is the government have decided this place has fallen apart so completely that they are dissolving the parliament for the day entirely,” he told the lower house on Thursday. Burke said the coalition government was completely self-obsessed and had no regard for Australian voters. “There will be no question time today because they don't know who their ministers are ... they don't know who their prime minister is," he thundered across the chamber. Shorten said adjourning Parliament was a clear admission of failure and the coalition should hang their heads in shame. “The government may adjourn the parliament, but they cannot outrun the weight of failure of this government,” he said. “If anyone needs to depart from this place, it is not the parliament, it is this government of Australia who has lost the confidence not just of its own backbench, not just of the opposition, you've lost the confidence of everyday Australians.